F.C.E. 365 Firmware Manager allows you to manage your iDevice's firmware efficiently by using this tool that renders you able to decrypt, build, restore or patch, according to your needs. This tool includes a tool for getting the phone out of Recovery Mode with one click. You can also put the iDevice into Recovery Mode with one single button! It also makes use of ideviceinfo to query all information about your device whenever you need it. This tool is able to query all information about the connected device, such as IMEI, WLAN Address, IDs, Activation status, Serials, Sim Status etc. While owning an iDevice can be both useful and entertaining, sometimes you might bump into limitations that prevent you from unleashing its full potential. Fortunately, if you find yourself in the situation above, attempting to bypass those restrictions by turning to third-party software, such as F.C.E. 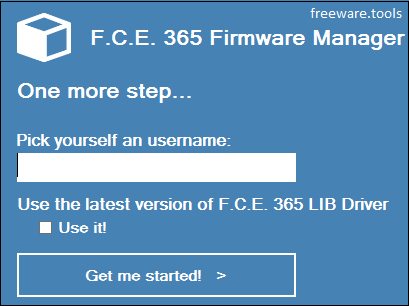 365 Firmware Manager, can be the best solution. Please be aware that this application requires you to have .NET Framework on your computer in order to run properly. Accessing and operating this tool's functions can be achieved effortlessly, as it does not require any installation. You just need to decompress the archive, run the executable and select your desired module from the main window. The core features are neatly organized in its interface and calling them is possible by either clicking the dedicated buttons under the LaunchPad tab or by navigating to the desired tab. F.C.E. 365 Firmware Manager enables you to modify your iDevice's firmware by performing various encryption, decryption and restorations to your current DMG file. Additionally, you can create and apply patches for ASR, iBSS or iBEC. It is possible that you can decrypt the original root filesystem DMG file contained within the .IPSW by using suitable AES keys. In a similar manner and by using the same key values, you can encrypt your newly modified DMG. Aside from the features mentioned above, this tool also packs a comprehensive toolkit that gives you the possibility of executing multiple processes, such as rebooting your device into recovery mode or querying useful information. Among the data it can retrieve, you can view the UDID, IMEI, WLAN address, activation status, baseband or iBOOT version. To sum it up, F.C.E. 365 Firmware Manager is a comprehensive toolkit that can help you manage your iDevice's firmware efficiently by providing you with many relevant functions.